I'm not a huge fan of accommodation + guided tour packages as I always want my freedom whenever I'm on vacation, but on our recent family trip to Puerto Princesa I had no choice. Getting the Underground River entry permits on our own seemed quite a hassle and I couldn't spare an hour of our short vacation on a DIY tour mishap. 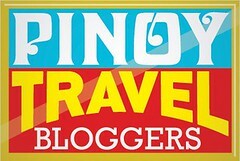 So, six month prior the trip, I went Puerto Princesa tour package hunting online. I shortlisted three budget accommodations and sent them an email. The first reply that I got was from Marianne Home Inn. The prompt and polite reply had me. So, when a rate tad cheaper than the online price was offered, I felt I need not to look any further. I immediately booked our stay and confirmed it by paying 50% of the total package. As soon as I stepped out Puerto Princesa airport's arrival gate, I noticed a string of men; each carrying a hotel banner. As the pick up and drop off are included in our family tour package, Marianne Home Inn's van driver was one of them. He brought us comfortably to our accommodation while giving us an overview of his hometown. Marianne Home Inn is merely 10 minutes away from the airport. I think Manong Driver was only able to say five of his top ten things-to-do in Puerto Princesa when we reached the accommodation. :) The 4-storey inn is situated across a public market, right in the middle of a barangay. Being in the midst of a residential area, Marianne Home Inn humbly stands tall with a pleasantly welcoming facade. Welcome drinks were offered as soon as we arrived at the reception desk. The ambiance is not fancy at all, but I greatly adored the modesty and the neatness of the lounge and the dining area at the ground floor. It was just 9 in the morning, hence I was really delighted when I heard that we can already check-in. My stomach, due to a foodie adventure a day before (Okay, I overate... there I said it! Boohoo! ), was terribly in pain that I needed to take some medication and rest before another foodie adventure commence. When the key was handed, I rushed to our family room and realized that it is at the fourth floor and there's no elevator! How foolish of me not to inform that I'm traveling with senior citizens beforehand! My cool parents, both very strong at 62, can still handle adventures (e.g. zip-lining, spelunking, snorkeling) but I can't afford to see them stair-climbing day and night on our supposedly stress free vacation. Though I wanted to pay the additional fee for a family room or two superior rooms at the first or second floor, there's none available. My parents, as cool as they always are, said they are okay and will be okay. So, we settled on our family room at the fourth floor. As expected and based on the price we paid, our family room is the simplest I've ever seen. It is extremely big for the four of us. With one double bed and four single beds, it can actually accommodate two more people! It has a free WiFi with strong signal. Yey! It has basic ensuite bathroom with a non-functioning water heater. :( Bad news for me who has an affinity to warm showers. A staff actually tried to fix it, yet he went out unsuccessful. So, I had to endure cold baths for three days straight! Nevertheless, I still had a comfortable stay. Our stay at Marianne Home Inn came with complimentary breakfasts. We were given the option to have it in the roof deck or in the dining area at the ground floor, and we were able to try both. We had our first morning meal at the deck as the two tables at the dining hall were fully occupied. I actually found the roof deck better and more convenient for us. It's just one floor above our room and the scenery... oh it is stunning! 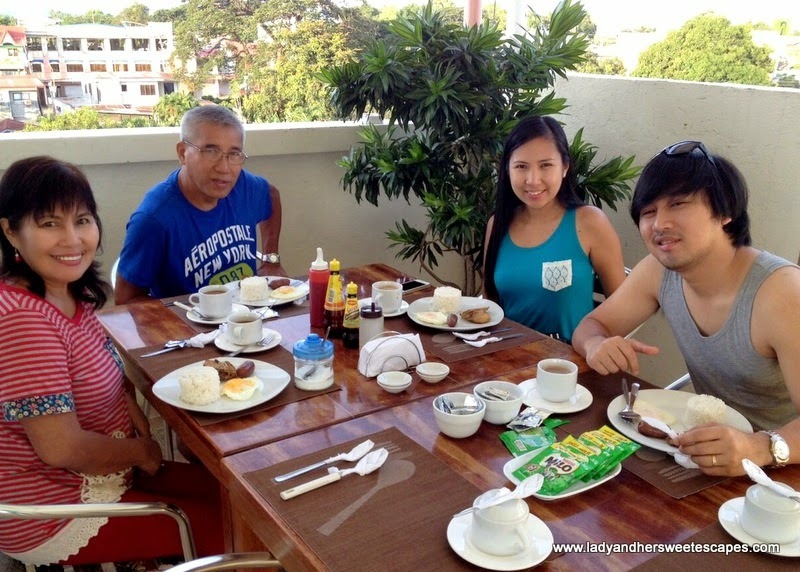 It was nice to have a good ol' Filipino breakfast with fresh air, warm sunshine and a good view of the town and the sea nearby. As for our breakfast at the ground floor, it was unplanned. We woke up early on our last day in Puerto Princesa for our spontaneous DIY Honda Bay tour. Yup, Ed and I went out of our minds once again and dragged the parents to a quick 'two island in two hours' Honda Bay trip. Anyway, I'll write more about it soon. Let's get back on topic! Breakfast is only served from 6 to 10am. We informed the receptionist that we'll take ours after our Honda Bay tour as we have to leave at the break of dawn. But when the kitchen staff saw us at the dining area taking our coffee at 5am, they immediately cooked and served us our breakfast.